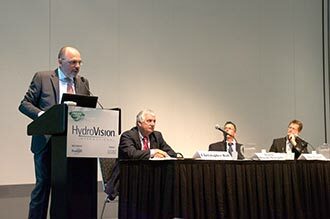 Sorgent.e Holding attended Hydrovision International in Denver, Colorado, the most important conference on hydropower in North America whose 2013 edition was held on July 23-26. The many visitors that stopped by the booth 877 could check that Sorgent.e Holding is not a conventional player in the market, its companies cover three very different activities: turbine manufacturer (MJ2 Technologies), EPC contractor (STE Energy) and investor (Sorgent.e). According to the features of every single project, Sorgent.e Holding, as a matter of fact, can play either a global role or perform only one of its faces. In a crowded session on “Development of a Successful Hydro Project”, Daniele Boscolo – CEO of Sorgent.e Holding – addressed a speech that went throughout the experience of Sorgent.e Holding building, operating and owning small hydropower projects on irrigation canals in the north of Italy. Different sites with similar flows and heads have hosted smaller and smaller powerhouses along the years reaching the most optimized solution by using the VLH technology. After showing a chart overlapping the evolution of these plants, Boscolo conveyed an explanation on how Sorgent.e has exported this expertise in Chile, becoming the biggest small hydro power producer in that country by building plants on irrigation canals for more than 40 MW. The experience that the Italian group has accrued working in South America with local communities is now part of its core know-how to be applied worldwide. The effect of Boscolo’s speech was overwhelming, hundreds of developers of micro and small hydro in North America visited the booth 877 gathering more information about the VLH technology and Sorgent.e methodology in order to apply them in the Canadian and American sites. After 3 days of meetings, exhibitions and speeches, Hydrovision 2013 closed with a session on technical papers. Marc Leclerc - president of MJ2 technologies - and Brian Robin – manager of MJ2 Northern America – presented the “Case Studies for a Fish Friendly Turbine in Low Head Small Hydro Sites.” After installing more than 30 VLH turbines in Europe, MJ2 has decided to launch in North America the most innovative product in the hydro market. This compact solution patented in 2003 works with heads between 1.4 meters and 4.5 meters and minimizes the required civil works to be allocated. With nominal capacities from 100 kW to 500 kW, the VLH turbines allow to exploit remote sites, ecological flows and canals. VLH has achieved the most fish-friendly performance among the existing turbines due to its low rotation speed. In short, a product ready to be delivered and installed in numerous projects under development in North America as well as in so many yet unexplored sites. Already based in Chile, Costa Rica and Canada, Sorgent.e Holding offers now its state-of-the-art technology, development skills and construction expertise in the whole Americas.